Modifier Options provide another level of customization for your products. 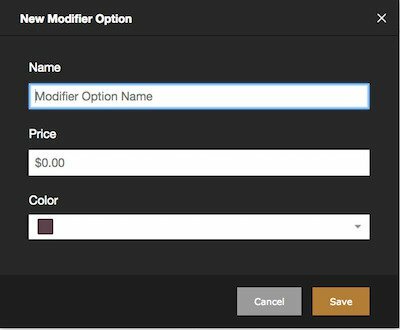 Whereas Modifiers customize a product, Modifier Options specify how. Like, specifying an amount or type. For example, if we have a Modifier Group for toppings and one of the toppings is cheese, we can create a Modifier Option to pick the type of cheese we want: Jack, Cheddar or Queso. When taking the order, it is very quick and natural. 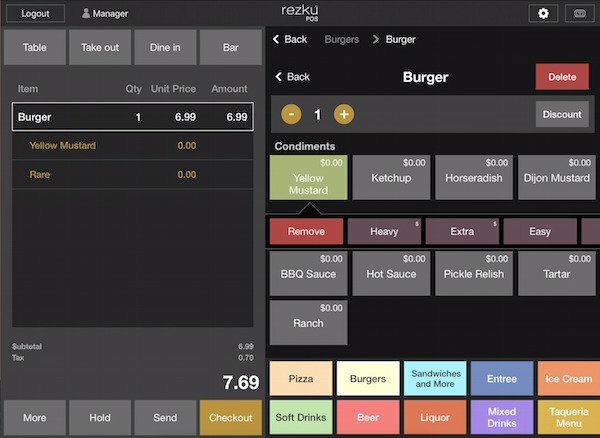 Just tap Cheese in the toppings list, to pick the kind of cheese to use. And the lettuce options are right next cheese. No scrolling or searching, everything is easy! 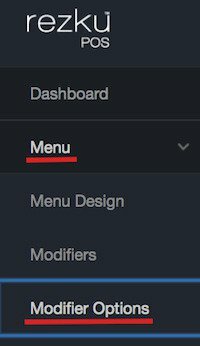 As you can see, Modifier Options make it very quick and simple to customize orders. Modifier options can also add to the price. ● For this example, we’ll create a Modifier Option called Amount. 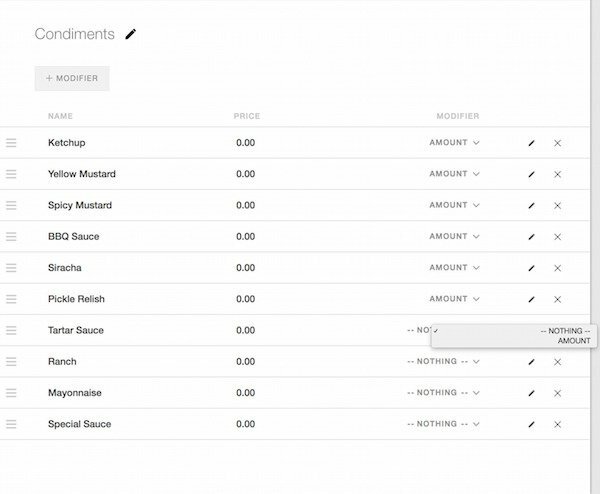 ● We’ll apply this Modifier Option to our Condiments modifier, to specify the amount our guest would like. 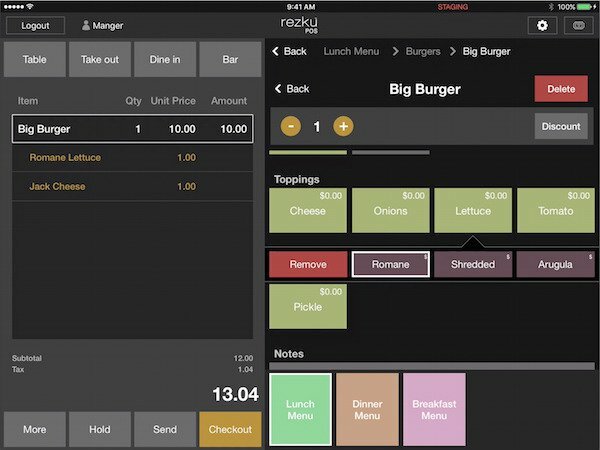 ● In Rezku Back Office Click on Menu in the left-hand navigation column, to display the Menu settings. ● Click on Modifier Options. ● If there are no Modifier Options created yet, the New Modifier Options Group window will automatically open. Otherwise, click + at the bottom of the column. ● Type a name for the Modifier Options Group. You’ll see the new Modifier Options Group name, in the list. ● To add modifier options, click the + Modifier Option button under the group name. The New Modifier Option window opens. 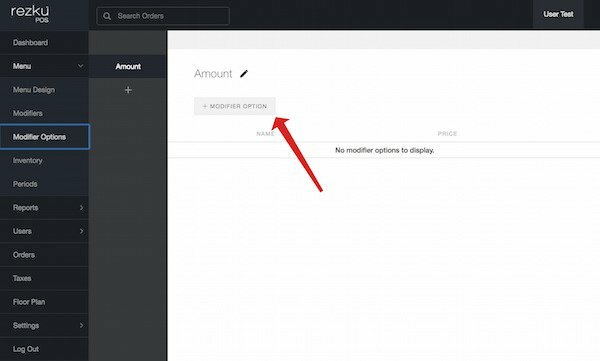 ● In the New Modifier Option window, set the name, price, and color for the Modifier Option. ● Continue to add options. The Modifier Options appear in the list. For this example, we added Heavy, Extra, Easy and Light. In the next step, we associate the Amount modifier options with the Condiments modifiers. To do anything with Modifier Options, we first need to associate them with a Modifier Group. To associate Modifier Options with a Modifier, click the word “Nothing” under the Modifier heading. ● Click the name of the Modifier Options you want, so the name shows in the Modifier column. 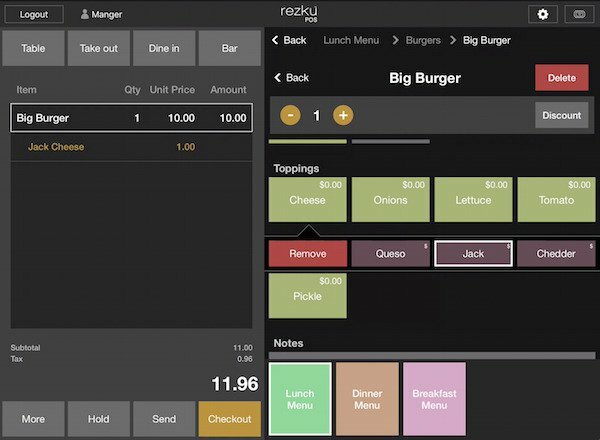 In Rezku POS, when condiments are added to an order, the server can easily specify the amount to use by tapping the menu bar.